See Removing Power From the System. See Disconnect Power Cords From the Server . Attach an antistatic wrist strap. Remove the hard drive that is adjacent to the DVD/USB module. See Four-Drive Capable Backplane Configuration Reference. See Eight-Drive Capable Backplane Configuration Reference. See Sixteen-Drive Capable Backplane Configuration Reference. Release the DVD/USB module from the hard drive backplane. 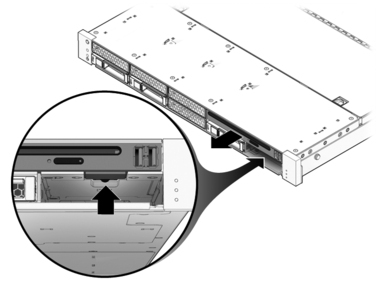 Use the finger indentation in the hard drive bay below the DVD/USB module to extend the release tab. Slide the DVD/USB module out of the hard drive cage. Place the module on an antistatic mat.